This year, we felt that although there were a number of worthy scenic pictures, there wasn't a prize winning picture of a LAMMer in action. So we decided to award both prizes for scenic phots that include a LAMMer. Paul and Simon will each receive a Lowe Alpine Goretex Mountain Cap. Congratulations to Jonathan Aylward and Stephen Bottomley on winning the Elite Competitiion this year. Jonathan and Stephen win £500 and free entry (plus flights and accommodation) for the Ladonia Mountain Trophy in Sweden. 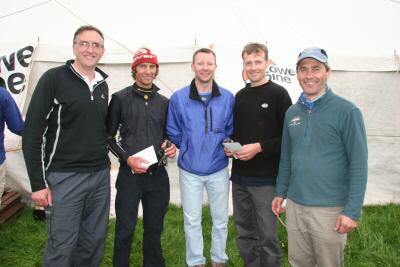 Outdoor Industry Champs and University Champs results added. During the weekend Jon Brooke photographed many teams. His photos are for sale via the Sleepmonsters website . The winning places were hotly contested on Day 2, with radical changes in position of the leading teams on several courses. The chasing starts made for exciting racing and, under the pressure, a few top teams made serious mistakes. Last year’s Elite winners, Kenny Riddle and Alec Keith, were a minute and a half behind the leaders and pursued them uphill from the start. However, thinking the leaders were taking the wrong line, they went their own way to the first control – only to spend 40 minutes looking for it in the wrong place. They had got the wrong grid line when fixing its position and were 1km out! The mistake meant they dropped to 6th place. HOT! Hardly a cloud in the sky. The Elite, A and B course competitors have a 20ish minute walk to the start from the event centre whilst the C, D and Novices catch coaches up to Bridge of Orchy. 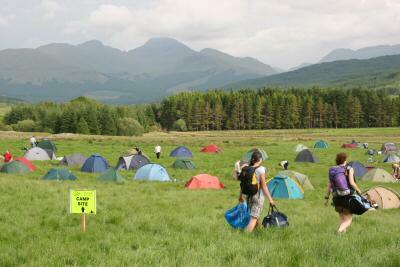 Day 1 routes are now on this website and a few pictures from this morning have been added to the photo galleries. The LAMM 2007 venue is the Scottish Agricultural College, Auchtertyre. From Crianlarich, travel NW on the A82 for 4 miles. You pass a sign on the right to Kirkton Farm and will soon see a yellow LAMM sign. Slow down and give plenty of warning to following traffic that you will be turning right as this is a fast road. A yellow LAMM sign will indicate where you turn right. Follow the signs and you will be directed to one of a number of parking areas. Those who arrive first will walk furthest to the Event Centre but this should not exceed 400M. If you are only stopping temporarily to register, please tell the marshal and you will park closer to the marquee and registration. Please only park as directed. If you are leaving Auchtertyre after registering, please follow the one way system on the track that passes Kirkton Farm and then rejoin the main road. Travel from Glasgow Queen Street -> Upper Tyndrum. Trains leave Glasgow at 12:38 and 18:21, arriving Upper Tyndrum at 14:51 and 20:29 respectively. Telephone 07836 384853 to request a lift to the Event Centre. The best place to stay at a LAMM is on the LAMM campsite but if you feel you can't cope with two nights in a tent, accommodation can be found in Tyndrum, Crianlarich and Killin. Auchtertyre is also home to Strathfillan Wigwams. These are all booked for Friday night so please don't pester Rena with requests for accommodation. On any other weekend, consider staying here in one of the sturdy insulated wooden camping cabins. 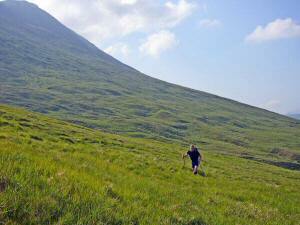 Strathfillan is an ideal base for a Munro bagging trip or family holiday. The farm shop has all the necessities plus local food and supplies - milk and dairy products, tea/coffee, tinned food, biscuits, fruit and sweets. After the remote far north in 2006, this year will be quite different and not only in that it's much easier to get to. There is quite a change in the terrain from last year's area, where only deer and geologists roamed, to this year which is rather special, being a hill walker and Munro bagger's paradise (not to mention the scattering of Corbetts on the map for the real aficionados). The hills might be more accessible than last year but they are bigger and just as distinctive and big mountains mean some serious route choice. The planner, Angela Mudge, has planned courses that will require plenty of thinking and decision making, so don't always jump to the seemingly obvious route. It can be a considerable climb over mountains, but also a long way round. Make careful choices! The terrain is typical of the high mountain areas away from the north-west Highlands, generally not as rocky, but with big grassy slopes, scattered crags, superb long ridges, big glens (and some landrover tracks) and big climbs. It's not all fast running since, like any hill areas in Scotland, there are plenty of areas of bog, tussocks, heather and bracken to slow you down, though overall you will be able to travel faster than last year. Hopefully this year the weather will be good enough to appreciate the excellent views from the high tops and ridges, but, anyway, look out for the golden eagles in the northern and western parts and deer everywhere. To sum up, it's a great area that will easily live up to the standards set in previous years for the connoisseurs' Mountain Marathon ! these features for fine navigation. Just remember it is not a purpose made orienteering map, but a map for travelling through mountains and gives you exactly the information you need for the LAMM. So far, we're delighted that 480 teams and the LAMM have so far contributed £1100 to our Climate Saving Contribution Fund. When your travel arrangements are finalised there is still the opportunity to update your team details on the Team Changes page at www.lamm.co.uk and to make a Climate Saving Contribution. An even better way to help is wherever possible to share transport to events such as the LAMM. Please try to make better use of the Share Car Hire and Lifts to the Event webpages. Seventeen teams took part in Lowe Alpine's first Outdoor Industry Mountain Marathon Championships. If both team members work in the Outdoor Industry, you should enter this special competition. To see more details of the 2007 championships and to register, visit the 2007 Outdoor MM Champs web page. This competition is now in its thirds year. If both team members study at the same University, you should enter this special competition. To see more details of the 2007 championships and to enter, visit the 2007 University MM Champs web page. 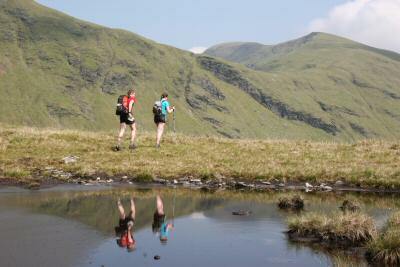 This is a new national championship comprising the leading Mountain Marathon events in the UK. If you are serious about the sport you will want to be part of the series. Each of the events in the series is slightly different so by taking part you can see how you compare over the 5 events of the series. You'll need to be able to cope with the rough terrain and bigger hills of the connoisseurs marathon  the LAMM, the Lowe Alpine Mourne Mountain Marathon, the rain and gales of the OMM, the solo navigational challenge of the Saunders Klets and the GL3D. For more details and to register for the series visit www.runfurther.com.